As Superior General of the Missionary Oblates, Fr. Louis Lougen, O.M.I. works among the grandeur of Rome. His office is just a few blocks from the Vatican, a long way away from the 18 years he ministered in the favelas (shanty towns) of Brazil. When asked recently if he would rather minister at the Vatican or in the favelas, Fr. Lougen answered without hesitation, “I would go to the favelas, the favelas are my kind of place.” Here Fr. Lougen writes about his time with the poor in Brazil and how the Oblates are currently working in “favelas” around the world. It was in Brazil that I learned so much about being a priest, a missionary, an Oblate of Mary Immaculate. 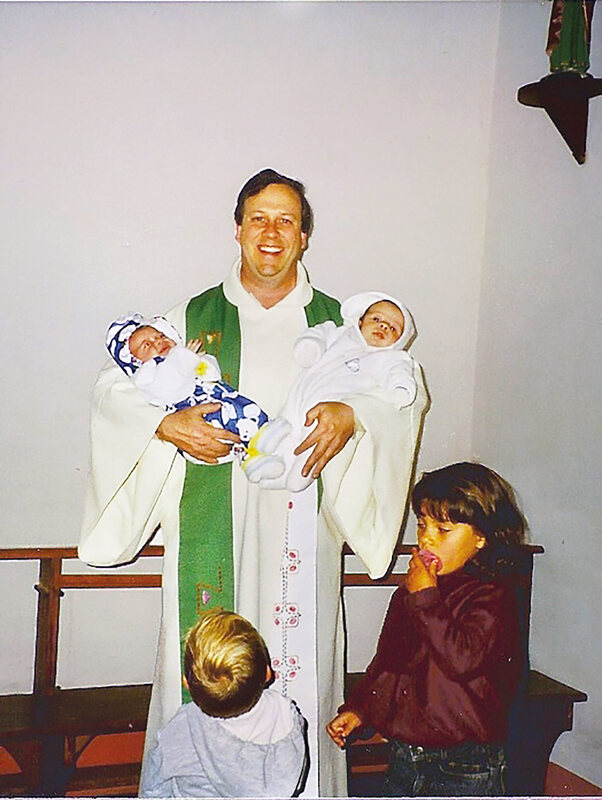 After four years of theology, it was among the poor that I went to “finishing school.” I was sent there to preach the Gospel, and in return the poor, through the witness of their lives, brought me closer to God and opened the meaning of the Gospel to me. The poor evangelized me. The time I spent in the favelas of Brazil were among the most blessed years of my life. I knew very closely the life and hardships of the poor and I saw the presence of the living God in people who had nothing but poverty and hardship. Their resilience in the midst of destitution was truly amazing. Their capacity for joy and communion with one another in the face of hopelessness, violence and utter disregard by others was astounding. In the favelas the Oblate charism was crystallized within me – to bring the Good News to the poor. It was an exciting time because the country was under a military dictatorship and the Church was a force of resistance in solidarity with the people. We supported the poor in their struggles for justice and human rights. It was a time of danger, sorrow and pain, but it was also a time of joy, love and goodness radiating from the poor. When I was elected Superior General it was a calling that I’ll admit was a little hard to accept. I love the Congregation and I took a vow of obedience, but if you asked where I would rather go it would have been back to the favelas of Brazil. 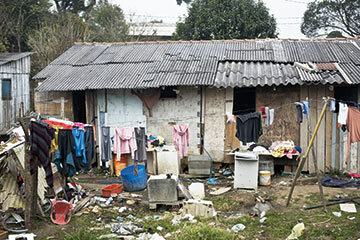 But being Superior General has opened my eyes to other “favelas” all over the world where the Oblates are working to improve the lives of the poor with the Good News of Christ. In Senegal, the Oblates and their Oblate Associates have formed a group called the Friends of St. Eugene, named in honor of our Oblate founder, St. Eugene De Mazenod. This group ministers in a kind of “favela” in the rural zone, where some 800 people suffer drought and oppressive heat without any medical assistance. The Friends of St. Eugene provide basic medical supplies to villagers, both to Christians and to Muslims, and it is for most people the only medical attention they will ever receive. Last year I was in the “favelas” of Cuba where four Oblates are working in seven parishes. I was shocked by the poverty of the elderly there. It is impossible for them to live on their pensions. So the Oblates at each parish have created a lunch program for the elderly people. After the celebration of the Mass during the weekdays, the community provides food and the Oblates eat together with the elderly and usually there is singing, dancing and fellowship. It is a wonderful, simple ministry and it is a way for the Oblates there to be close to the people. In Scripture we are told that God will do infinitely more than we can ask or imagine with the Holy Spirit working among us (Eph. 3:20). I discovered that in the favelas. It was there that I experienced God more and more as mystery, the mystery of love, of community and of solidarity; and I was walking in that mystery. When my time as Superior General is over, I would not hesitate to go back to the favelas. I would be very happy back in Brazil, but maybe it is a place like India or Bangladesh where our Oblate family is much younger. These younger Oblate foundations are always asking me to send them an older Oblate to journey with them. Maybe I am that older Oblate, a type of wisdom figure, although I don’t know how much real wisdom I have to share with them! Como Superior General de los Misioneros Oblatos, el P. Louis Lougen, O.M.I. trabaja en la grandeza de Roma. Su oficina se encuentra a solo unas calles del Vaticano, muy distante de los 18 años en que trabajó en las favelas (barrios marginales) de Brasil. Al preguntarle hace poco si preferiría trabajar en el Vaticano o en las favelas, el P. Lougen respondió sin dudar, “Iría a las favelas; son mi clase de lugar.” A continuación, el P. Lougen escribe sobre su período con los pobres en Brasil y cómo los Oblatos trabajan hoy en día en las “favelas” de todo el mundo. Fue en Brasil donde aprendí mucho sobre ser sacerdote, misionero, Oblato de María Inmaculada. Tras cuatro años de teología, fue entre los pobres que “terminé la escuela”. Fui enviado ahí para predicar el Evangelio, pero a su vez, los pobres, a través de su testimonio de vida, me acercaron a Dios y entendí el significado del Evangelio. Los pobres me evangelizaron. El tiempo que pasé en las favelas de Brasil se encuentra entre los años de mayores bendiciones de mi vida. Conocí muy de cerca la vida y dificultades de los pobres y encontré la presencia del Dios vivo en la gente que solo tenía pobreza y pesares. Su resiliencia en medio de las carencias es verdaderamente sorprendente. Su capacidad de comunión y la alegría frente a la desesperanza, la violencia y el absoluto menosprecio de los demás era increíble. En las favelas, el carisma Oblato se cristalizó en mí: llevar las Buenas Nuevas a los pobres. Fue un lapso emocionante, pues el país estaba bajo la dictadura militar y la Iglesia era una fuerza de resistencia en solidaridad con la gente. Apoyábamos a los pobres en su lucha por la justicia y los derechos humanos. Fue una época peligrosa, difícil y dolorosa, pero al mismo tiempo de alegría, amor y bondad, que irradiaba de los pobres. El ser electo Superior General fue un llamado que admito fue algo difícil de aceptar. Amo a la Congregación y tomé un voto de obediencia, pero si me preguntaran adónde preferiría ir, tendría que ser de vuelta a las favelas de Brasil. Como Superior General he abierto los ojos a otras “favelas” en todo el mundo, donde los Oblatos trabajan para mejorar las vidas de los pobres, mediante las Buenas Nuevas de Cristo. En Senegal, los Oblatos y sus Asociados Oblatos formaron un grupo llamado los Amigos de San Eugenio, en honor de nuestro fundador Oblato, San Eugenio de Mazenod. El grupo trabaja en un tipo de “favela” en el área rural, donde cerca de 800 personas sufren de sequía y calor excesivo, sin ninguna ayuda médica. Los Amigos de San Eugenio proporcionan ayuda médica básica a los aldeanos, tanto cristianos como musulmanes, y para la mayoría de ellos es la única atención médica con que podrán contar. El año anterior estuve en las “favelas” de Cuba, donde cuatro Oblatos trabajan en siete parroquias. Me impresionó la pobreza de los ancianos en el lugar. Es imposible que sobrevivan con sus pensiones, por lo que los Oblatos en cada parroquia crearon un programa de comida para ellos. Después de la Misa entre semana, la comunidad aporta comida y los Oblatos la comparten con los ancianos. Generalmente hay cantos, baile y camaradería. Es un ministerio maravilloso y sencillo; una forma en la que los Oblatos estén cerca de la gente. La Escritura nos dice que Dios “es capaz de hacer mucho más de lo que nosotros pedimos o pensamos” (Ef. 3:20) con el Espíritu Santo trabajando entre nosotros, y fue lo que descubrí en las favelas. Fue ahí donde experimenté más y más el misterio de Dios, el misterio del amor, de comunidad y de solidaridad; y me encontré transitando por él. No dudaría en volver a las favelas al terminar mi mandato como Superior General. Me daría mucho gusto estar de vuelta en Brasil, aunque tal vez en lugares como la India o Bangladesh, donde nuestra familia Oblata es más joven. Estas fundaciones más recientes siempre me solicitan enviar a un Oblato mayor para acompañarlos. Tal vez yo sea ese Oblato mayor, algún tipo de figura de sabiduría, ¡aunque no sé qué tanta sabiduría tenga para compartir con ellos!